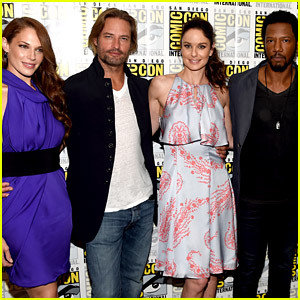 Josh Holloway poses with his co-stars while attending a 2016 Comic-Con panel for his show Syfy show Colony on Thursday (July 21) in San Diego, Calif. The 47-year-old actor was joined by Sarah Wayne Callies, Amanda Righetti, Tory Kittles, Adrian Pasdar, and Peter Jacobson. In an interview with ComicBook.com, Josh says that fans can expect the show to be a lot darker in season two. FYI: Tory is wearing a Triton necklace. Sarah is wearing Aldo shoes. James Van Der Beek's Wife Kimberly Debuts Her Baby Bump! 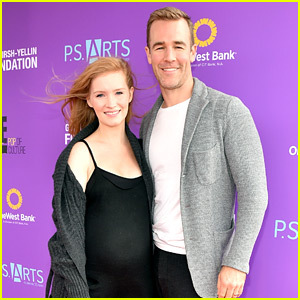 James Van Der Beek and his wife Kimberly hit the red carpet for the first time since announcing they’re expecting their fourth child at the 2015 Express Yourself event held at Barker Hangar on Sunday (November 15) in Santa Monica, Calif. The event benefited P.S. Arts, which helps to provide arts education to public school students. Also in attendance were Jason Bateman, Lisa Kudrow, actress and model Molly Sims with her son Brooks, The Mentalist‘s Amanda Righetti, Jenna Elfman, cute couple Ryan Newman and Jack Griffo, Community‘s Joel McHale, Parks and Recreation‘s Adam Scott, Scandal‘s Dan Bucatinsky, Royal Pains‘ Mark Feuerstein, and more. FYI: Molly‘s son is wearing King of Harts by Melissa Joan Hart clothing. The 41-year-old former supermodel brought along her kids Leni, 10, Lou, 5, Henry, 9, and Johan, 8, to the big bash. Also at the event was Jordana Brewster with her son Julian, 1, Elizabeth Berkley, Soleil Moon Frye, and Amanda Righetti. 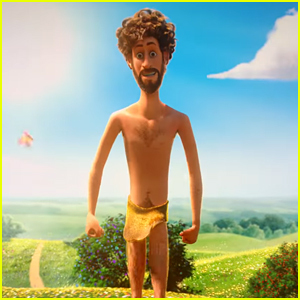 Heidi just got back into town after spending time in her home country. “Goodbye Germany …. Goodbye Bratwurst….” she tweeted. FYI: Amanda is wearing a Paule Ka sweater and a Wilfred Free for Aritzia skirt. 'Mentalist' Actress Amanda Righetti Welcomes a Baby Boy!